Walking down the driveway before her morning run, Angela Soll checks in on a little box that perches on a wooden stand. Made from extra bits from the roof and scraps from here and there, it's a miniature replica of her home. One big door opens to a variety of books. Today's selections include: Walk Two Moons by Sharon Creech, The Hunger Games by Suzanne Collins, and Slam by Nick Hornby—to name a few. 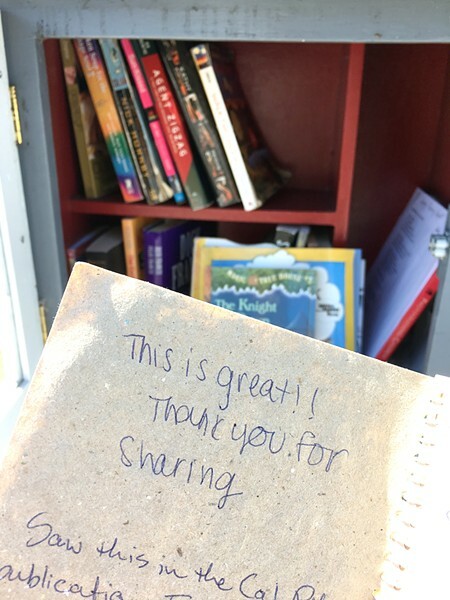 SHARING With the help of a neighbor, Angela Stoll created a space where her neighbors could share their love of books. 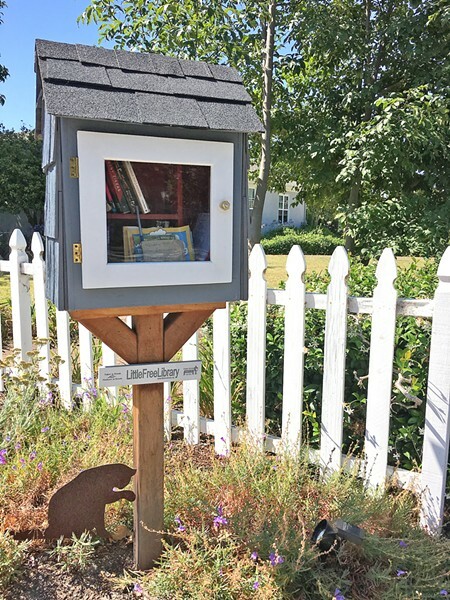 It's a Little Free Library that Soll created for her neighborhood to enjoy, a small portal for book lovers to peek into, take a book to borrow, and leave one behind. "The good thing is it rotates. I think I originally started with five books that I put in, and then people started putting books in and taking some, too," she said. Soll was inspired to make the library exchange after seeing an old friend while picking up her daughter from college in Portland, Ore. She found out his summer plans were to construct a little library, and that prompted her to do some research. "We took a look around the area and I feel like there was a little library literally in every neighborhood. I wanted to do that for my neighborhood back home," Soll said. "I see a lot of Cal Poly students ride their bikes through the neighborhood and they'll ride past the library and then they'll come back and look at it." The Little Free Library website (littlefreelibrary.org) has tips and instructions on how to make a box of your own—it even provides the option of purchasing a kit or a completed library. But if you're looking to add a personal touch, and don't have the tools, SLO MakersSpace has you covered—all you need is the material and a SLO County Library card. Cardholders can come in Tuesday through Friday from 4 to 7 p.m. and Saturday from 10 a.m. to 1 p.m. Greg Money, shop manager of the space, said before a newcomer can use any space or tool at the facility, they have to take a free safety training class on how to use equipment and the wood shop. "If someone has a specific question about how to use a tool, every department in the MakerSpace has a guru, as we call them. For the wood shop, it's Richard, and if you visit him during his office hours he can answer questions about the best tools to use to let's say make the little library," he said. COMMENTS Some little libraries have comment books where borrowers can write about their experience of stumbling upon the little box on a walk around the neighborhood. "When you start something at the MakerSpace, it expands and grows, we even have a lot of businesses that flourish from projects made here," he said. Just below the door of Soll's library is a plaque that reads "Little Free Library," but not all boxes have that official nameplate. It has to be registered—as the name is trademarked. The one-time registration costs $40. Being official gets the library placed on a world map, so borrowers can easily find a book exchange in their neck of the woods. Not all libraries have to be registered: Some are just sitting around waiting to be found. CEO Clint Slaughter of SLO MakersSpace wants to take the concept a step further with a little free pantry idea. "My wife actually saw the idea of a free little pantry. It's the same concept design as the library but with shelves and space big enough for dried foods," Slaughter said. Staff writer Karen Garcia is leaving a book in her neighborhood library at kgarcia@newtimesslo.com.